Eighth Grade (2019) is a coming-of-age film written and directed by YouTuber Bo Burnham, with this film being his directorial debut. This film stars newcomer Elsie Fisher (nominated for this role at the Golden Globes) as Kayla, a shy eighth grader who is about to finish middle school. 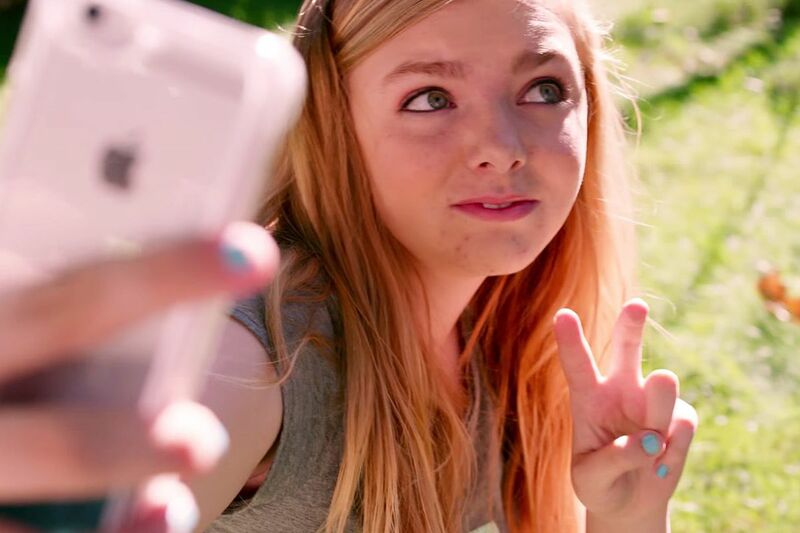 The film follows her on her final week at eighth grade and what life is like for teenagers at school at this time. Elsie Fisher is a breakout star in this film. She gives such a real and authentic performance here that you will forget that she is actually giving a performance. Unlike a lot of recent films and performances of the year which are bold and dramatic, this performance from Elsie felt real and subtle, something that was refreshing and felt genuine to the situation. There were times that felt uncomfortable and awkward about her performance, but that only enhanced the character's personality and the awkwardness was done so well. It is not only her performance that helped the film feel real, but just the entire film overall. There is nothing showy in particular to the film and how it is shot or edited, but that is the beauty of the film. It almost feels like a documentary focusing on real eighth graders, and despite it being a work of fiction it may as well be a documentary. It gives a great insight to the minds and behaviours of teenagers at this time, and absolutely nothing about this film is glamourised. All of the cast here are fantastic in their roles. Kayla's father (played by Josh Hamilton) seems like the perfect father yet is also grounded and well realised as a supportive parent, not just some fantasy. All of the eighth graders act and look like eighth graders, not just actors who are way older pretending to be children. It all helped to ground the film and make the documentary feel of the film even more real. Bo Burnham has managed to take such a small moment and time of our regular lives and highlighted the importance of those days. There was no need to over-dramatise the events, as these small moments are important to anyone at that day and age. He could have made Kayla a huge YouTuber, or tried to age the character's maturity and make Kayla stronger and more independent. But he didn't. Bo knows how not only how these eighth graders would act and talk like, but also how they should be represented. The script is so well balanced and tonally spot on. I have been complaining about recent films that have been confused on their tone or script, but this one has no flaws to it. When something is meant to be awkward and cringe, it is awkward and cringe. When something is meant to be funny, it is absolutely hilarious. When a particular moment in the film hits and it is dark and disturbing and horrifying to watch, it is worse and more terrifying to watch than most horror films this decade. The aspect that I was worried about watching the trailers and knowing the story was how the YouTube aspects was going to be implemented. I was worried that it would get repetitive or over done, making Kayla a bigger YouTuber or focusing on that aspect. It did not do that whatsoever. Bo makes sure to show the audience her unfortunate low views, as well as her struggle with keeping up with the channel. The videos are very well edited and written into the script, keeping them as transitions into scenes and giving the audience a chance to enter the head of Kayla at that moment. I know it comes out in the UK the day after Avengers: Endgame. I get that. But this film was nearly as anticipated as Endgame for me and it still exceeded all of my expectations. It was well worth the wait to get to see it on the big screen and I have no idea if any other movie this year will knock this film off the top spot. I have a feeling I have seen my favourite film of 2019, and I just want other people to recognise how beautiful this film is. Have you been able to see Eighth Grade yet? Did you love it just as much as me, or did this review persuade you to try and see it in the mental week of the end of April? Comment down below and let me know your thoughts.